Do you usually take your old faithful tent or sleeping pad with you whenever you go camping? Well, why don’t you try something different this time? Bring a hammock with you the next time you go camping, it won’t disappoint you. If anything, it will heighten your expectations for the next camping journey as they take up less space, are easier to set up, and are super fun! Q: How many people will fit into this hammock? Q: Can I attach an under quilt to it? Q: Is the layer of the material that you lay down on double layered? Q: Is the mosquito net removable? Q: How durable is this product? This hammock comes fully equipped with high-class nautical grade carabiners, a starter rope kit, and a net suspension kit, enabling you to set it up almost effortlessly, and it won’t even cost you much time; although that varies from one person to another. But whatever amount of effort that you put into setting it up is definitely going to be worth it once you’re inside, ready to spend the night out in nature. It is perfect for relaxing; whether it is while camping or on just another hot summer day when you just want to laze around in your backyard with a glass of juice in one hand and a book in the other. Moreover, it is more comfortable than a regular sleeping pad or tent and gives you a more “holiday” or “chilling- vibe” than a tent does. This hammock makes every holiday better! The hammock comes with a mosquito net which will protect you from waking up with mosquito bites and a high chance of malaria the following day. Plus, it has a double sided zipper, which makes it easily accessible from both sides. If the weather is a bit chilly, just turn the hammock upside-down so that the net is below you, and enjoy a good night’s sleep. For better convenience, place a sleeping pad under you so that bugs can’t get to you through the net. What’s better than a night out in nature, away from all the worries and with the surety that the bugs can’t get to you, right? With this hammock, you can sleep anywhere you want, even over a river! The hammock itself has a fairly lightweight of around 26.45 oz, but as it is made from 100% parachute nylon (70D nylon) it is able to bear all the elements that it comes with, as well as a maximum weight of approximately 180 kgs. You no longer need to worry about falling off, or waking up on the ground when you’re using this hammock. And thanks to its lightweight and the stuff sack that comes with it, you can carry it around without getting too tired because it will fit into your backpack without any difficulty! It has a size of 10’6” X 5’, making it bigger than most mosquito-proof hammocks. If you’re a fan of star gazing or if it was always your dream to fall asleep right under the stars, this hammock will make your wish come true! Through the mosquito net, you can gaze at as many stars as you want and fall asleep whenever you want, without facing any sort of discomfort. The hammock is big enough to hold you and you don’t need to stay curled up into a ball the whole night. Even if you toss and turn in your sleep, you’ll still wake up to find yourself above the ground; just make sure to choose strong trees as your hammock support. Comes with high-quality nautical grade carabiners, starter rope kit, and a bug protection net suspension kit. Has a two-way zipper for easier access. Made from 100% parachute nylon and is very durable. Easy to carry and comes with a stuff sack. 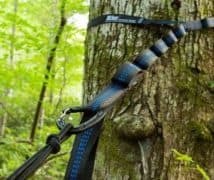 No need to buy extra ropes, unless trees are very far apart. Mosquito net ripped, despite using carefully, for some. There have been complaints of the zipper breaking and had to be sewn back into place. Has a high price, but the positive features make up for it. Does not come with suspension straps. A: One person will fit in comfortably as this is a single hammock. 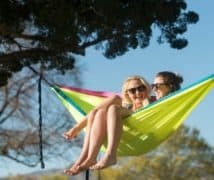 Even with double sized or larger hammocks, if two people lie inside, then, there are chances that they will be squeezed towards the centre which may feel uncomfortable. For this reason, single hammocks are better. A: Yes you can do so to improve your comfort level. 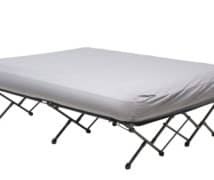 A: No it’s not, but you can add a sleeping pad to prevent getting bitten by bugs from below. Despite that, the hammock is pretty comfortable. A: No, it is permanently attached to the hammock. A: As this is made from 100% parachute nylon fabric, you can expect it to handle everyday wear and tear and rough usage but, to prolong its life, we suggest that you set it up properly and maintain the weight limit. 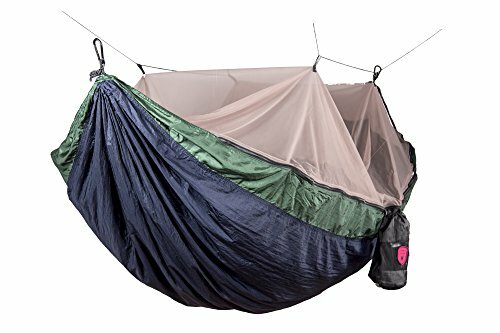 This easy to carry hammock will make your camping expedition more fun and memorable. You won’t regret buying this once you see how well it serves you. 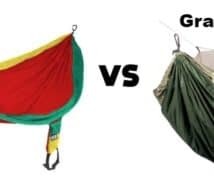 Even though this hammock may have some shortcomings, it is easy to ignore them given the overall performance of it is truly spectacular, one that will not fail to impress you.